Parents speak out after their children were pepper sprayed at school. 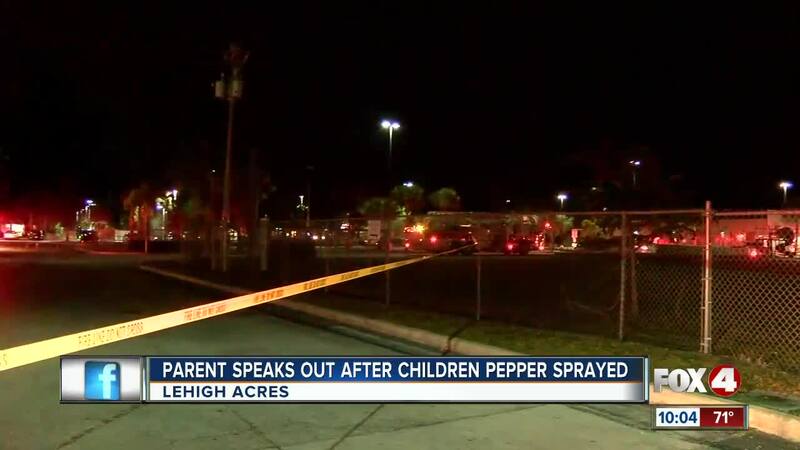 10 kids and two adults have been discharged from Lehigh Regional Medical Center after a pepper spray incident. Hospital officials say they activated a mass casualty protocol after being informed that several people had been exposed to an irritant at G. Weaver Hipps elementary Friday night. "We kept all the patients here at the scene until the hazardous materials team could analyze the scene, and to assure that all those patients could be discharged, and they didn't need any further decontamination," said Director of Critical Care at Lehigh Medical Center Richard Juda. Patients were sent home with a bottle of Dawn soap which can be used to wash away pepper spray. The incident happened during a school dance. Deputies are investigating how the pepper spray was discharged. We are currently following a story of a possible Hazmat situation at a Lehigh Acres School. was hosting a school dance for students and parents. That's when an unknown irritant was discharged in the cafeteria. The cafeteria was immediately evacuated. Thirteen people have been transported to the hospital. A viewer tip says there are many ambulances at Lehigh Hospital bringing. They have Hazmat on the scene. Count on us to keep you updated as we learn more.